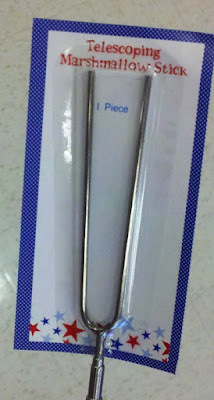 While passing by the $1 bins at Target today, I saw "Telescoping Marshmallow Stick". It telescopes out in 4 or 5 pieces. 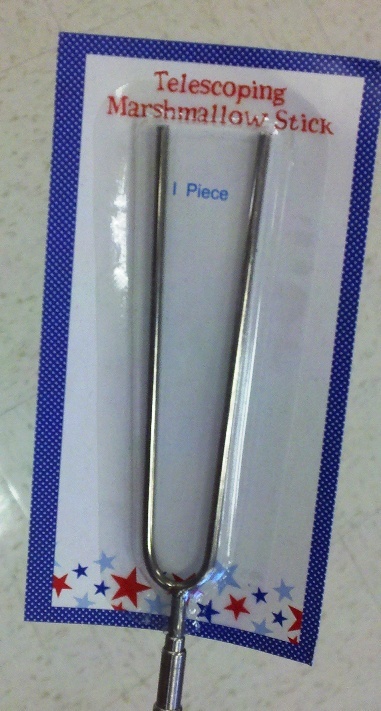 The bottom piece attached to the handle was about 3" long, but the other sections were about 5" long. The metal seems to be very light aluminum, so the handle & fork might be pretty easy to remove. I doubt the friction between the sections would be enough to support the weight of something has large as a Wing of War plane. & any significant lateral force when extended would probably easily bend the tubes. But these might work well for microarmor scale or smaller planes or scifi fighters. Finally tried Song of Blades & Heroes for the 1st time. 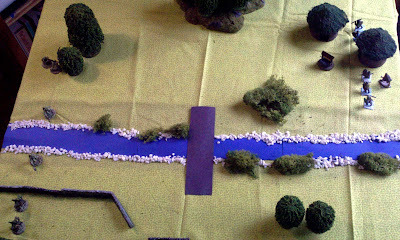 I used the Bridge Over MurkyRiver scenario from the 2nd issue of Ganesha Game's Free Hack magazine. 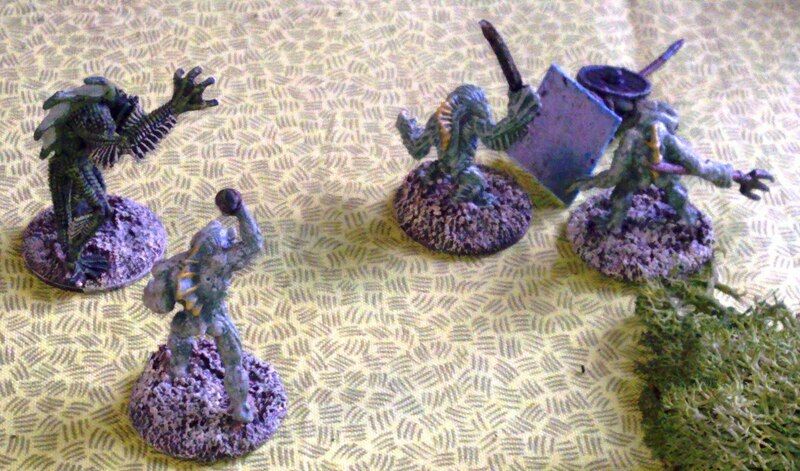 But since I didn't have Lizardmen & Wood Elves, I turned them into Deep Ones & Vikings. The racial characteristics (Amphibious for the Lizardmen, Forester for the Wood Elves) matched the substitute races well, so it was just a direct replacement. 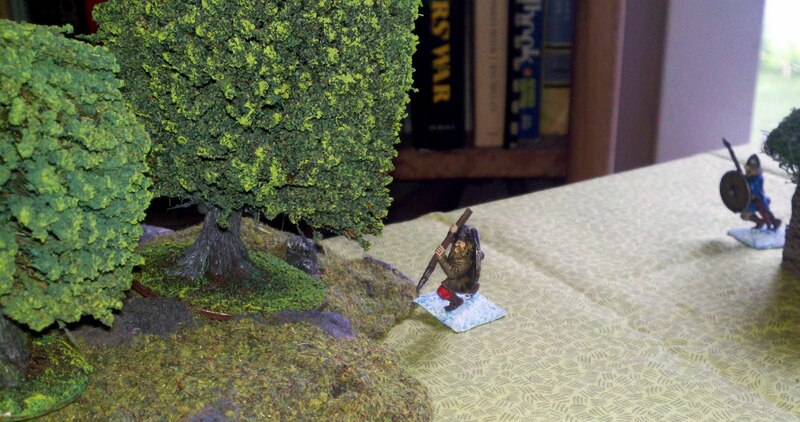 The scenario is a Deep One shaman leading a scouting part to capture a bridge on the edge of the Viking territory. Here's the board setup that was specified in the article. 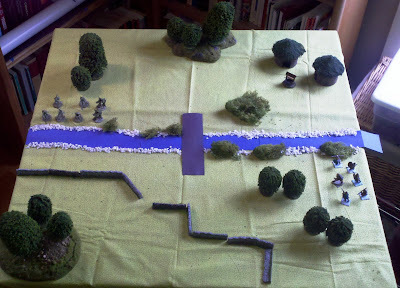 When using 25mm figures, the game calls for a 36"x36" play area. But I played on my collapsible painting table, which is 32.5"x32.5", so it was a bit more cramped, but still worked well. Unfortunately, I had to raid my daughter's art box to get construction paper for the river & the bridge. I've already got the makings for rivers, but will definitely need to work on a bridge for future games. 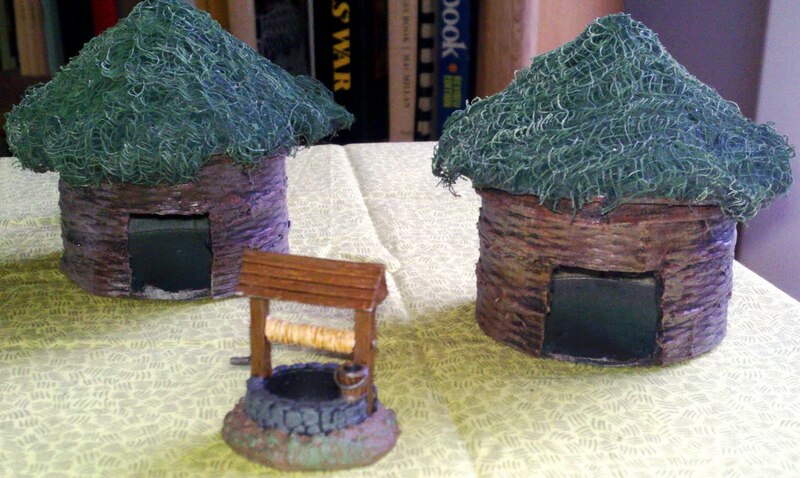 Since I'd recently made some huts for another game, I threw those onto the board & turned it into a small Viking outpost. 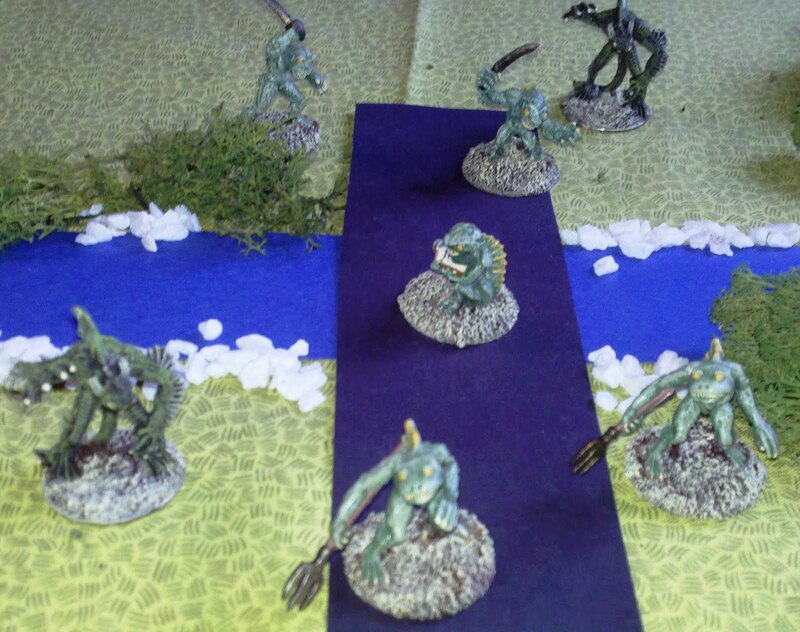 The Deep Ones forces were 1 Shaman, 2 Warriors, 2 Skirmishers (3" range band Javelins) & 2 Savage Deep Ones (harder to activate, but more violent in battle). The Vikings had 1 Shaman & 5 Long Bowmen. Both warbands ended up being just under 300 pts, the standard size for a force. Here's the initial force deployment. The Vikings set up around their outpost in the upper right corner. The Deep Ones spread out across the left side, with the Savage Deep Ones inside the wall, the Warriors on either side of the river, & the Shaman & Skirmishers behind the trees in the top left corner. 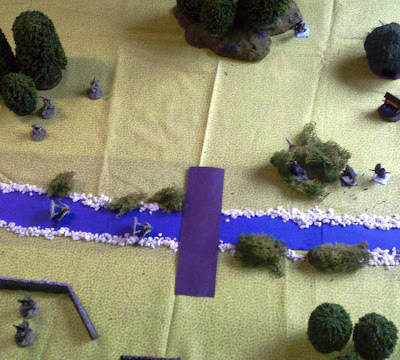 But after the game was over, I realized it be more interesting to have the 2 forces deployed so the river was a natural barrier between them. The Vikings went 1st, with the Shaman (figure near the back without a shield) & 3 of the Bowmen rushing to the brush by the bridge (Vikings' racial skill is to move through woods & brush without penalty). The other 2 Bowmen try to outflank the Deep Ones to gain the high ground on the hill at the north of the board. 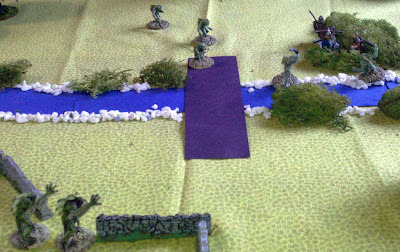 The Deep One Warriors dive into the river (their racial skill was to move through water without penalty) while the rest of the Deep Ones advance. 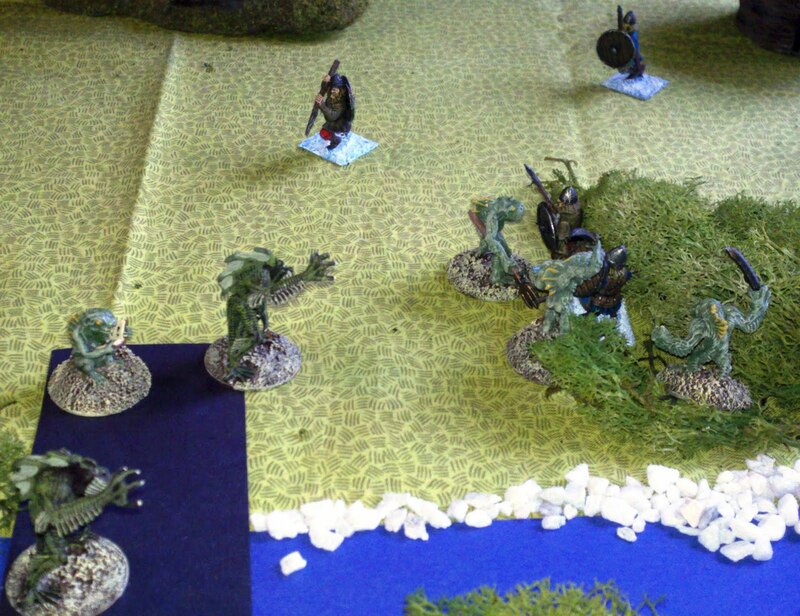 The main Viking party finishes moving into the brush & prepare to ambush the Deep Ones. Unfortunately, the Deep Ones are still outside the Vikings' 7" longbow range (* see note below). The flanking Viking force doesn't get very far due to bad dice rolls. The Deep One Warriors speed under the bridge & pop out of the water right next to the brush the Vikings are hiding in. So much for the Vikings' long range advantage. The Savage Deep Ones slowly move up, but due to them being harder to activate, they aren't able to make multiple moves in 1 turn like the others, so don't move too fast. The Vikings in the brush fire arrows & magic to little effect, while the flanking force is still moving slow. The Deep One Warriors reach the Vikings in the brush, but don't have enough actions to attack them yet. 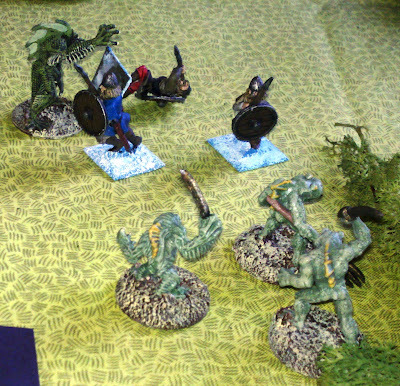 The Viking Shaman is confronted by one of the Deep One Warriors (right side in the picture above), which won't end well. So he tries to run away but gets cut down as he turns around. 1st blood to the Deep Ones. The other Deep One Warrior knocks down his opponent. 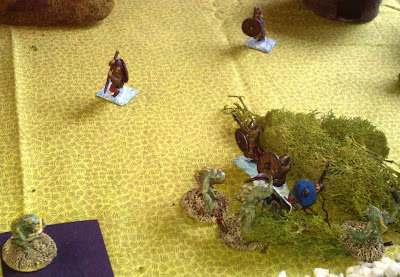 The flanking Vikings finally are close enough to be of use & shoot down one of the Deep One Skirmishers. 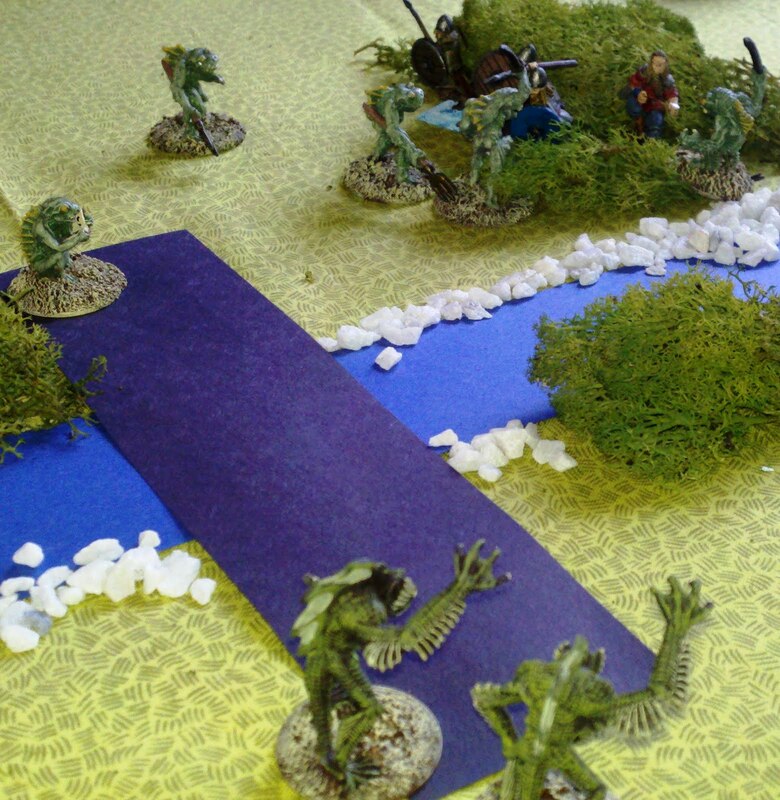 The Deep One Shaman & the unengaged Vikings exchange spells & arrows to no effect. The Vikings continue to be ineffectual in melee, while the flanking Vikings fire with a similar success at the Deep Ones. 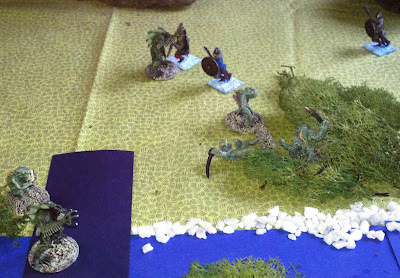 The fallen Viking is skewered by the Deep One Warrior. Both sides knock an opponent over, but the Deep Ones are the only ones able to seal the deal, killing the 3rd Viking. This causes a Morale check for the Vikings after losing half their force. The 2 flanking Vikings stalwartly stand, but the 3rd Viking, facing 3 Deep Ones on his own in the brush makes a strategic withdrawal. After that, it pretty much goes downhill even more for the Vikings. They were able to kill one of the Savage Deep Ones. But then the Vikings were all chased down & killed to a man. 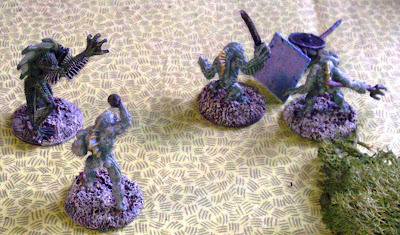 The Deep Ones gibber in celebration of their total victory. Overall, a fun, light game, but with some tactical depth due to the multi-activation rule. It took me about an hour to play, with lots of flipping through the rulebook since it was my 1st time playing. But with really only 7 pages of basic rules, the flipping was very quick. I noticed a big difference in performance between the regular Deep Ones (needing a 3+ on a d6 to activate) & the Savage Deep Ones (needing a 4+ to activate). The affect of that 1 point was quite noticeable. But, the crushing defeat of the Vikings came down to my usual bad dice rolls. While I could easily activate the Vikings (needing 3+), when it came to hitting, I regularly rolled 1-3s, against the Deep Ones 4-6s. Actually, in the middle of the game, there was a series of about 6 consecutive turns where I failed badly enough activating the 1st figure on a side, that initiative passed immediately to the other side. So effectively, both sides took a long tactical pause, just staring at each other, since I was unable to successfully activate either side. *NOTE: I also just realized I was doing ranged combat wrong. I only allowed the ranged weapons to fire 1 ranged band. The Vikings were only firing 7". But ranged weapons are supposed to be able to fire up to 3x their range band. So they should have been able to fire almost all the way across the board. It would have been initially at a -4 to hit, but that still would have given them a lot more chances to take the Deep Ones out before they got into melee.